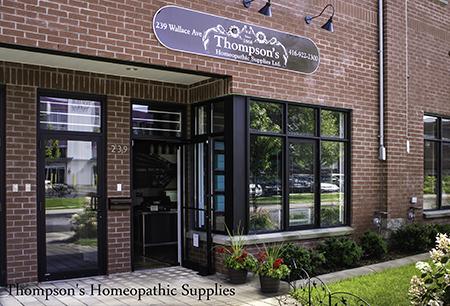 Thompson’s is undeniably Canada’s oldest supplier of Homeopathic Products. Our line of homeopathic preparations is designed by a group of dedicated practitioners. We have over 150 years of experience in supplying beneficial products to practitioners and patients of traditional and homeopathic medicines. All of our products are prepared under carefully controlled conditions by our devoted team of professionals according to GMP. We have a wide array of remedies manufactured to Hahnemann’s exact standards. We are pleased to inform you that after 145 years being on Yonge Street we are now relocated at our new facility. It is our full intent to continue to operate in the future as we have in the past with integrity, responsiveness, passion, and focus on quality. Thompson’s has been in operation as a Homeopathic Manufacturer since 1868 and produces classical single remedy and combination remedy products. We are widely known for our unique creams and ointments. We also have the experience of many projects with Custom Formulations. We know what works at every stage, and have the expertise and resources in place to make your formula as successful as possible. Our consistent team will focus on bringing you the most efficiency to your project by a manufacturing process that is economical and built to deliver repeatable quality. We have clients ordering from all over the world for a good reason. Thompson's has been around since 1868. In August, 2014 we moved to 239 Wallace Ave., after 145 years being on Yonge Street.